When it comes to making gorgeous fragrances and capturing those emotions, Ecoya is the name to remember. This Sydney-based company makes beautifully scented products using only the finest fragrances and essential oils. Created for discerning customers across Australia and worldwide, each Ecoya product is proudly Australian made with the utmost care. Ecoya’s annual Christmas collection has been filling homes with delightful and festive scents, and their 2017 range is no different. With entrancing Christmas-themed aromas including Fresh Pine, Summer Spritz and Dark Chocolate, Meringue & Raspberry, Ecoya’s 2017 Christmas collection will have you swooning with delight. Made from hand-poured soy wax - a natural alternative to paraffin (petroleum) candles. 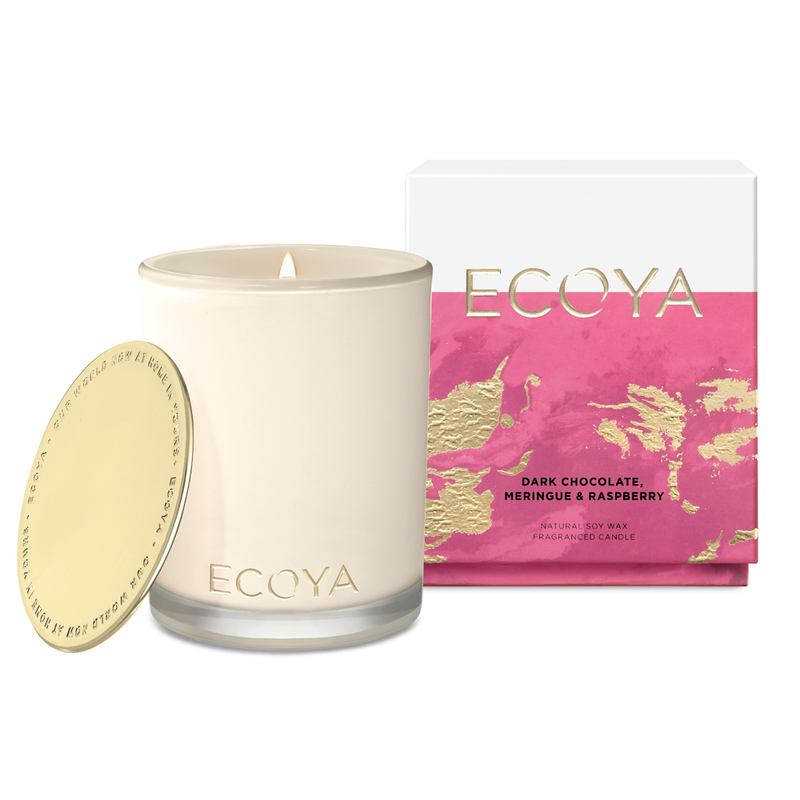 An indulgent composition infused with almond, velvety chocolate and hints of the sweetest Indonesian vanilla, red raspberry and caramel. Wicks are made from pure lead-free cotton. Burns for up to 80 hours. Candle is set in a glass jar, complete with a gold lid. Presented in an Ecoya box. Fragrance: Dark Chocolate, Meringue & Raspberry. Dimensions: 12cm (h) x 9.5cm (w).